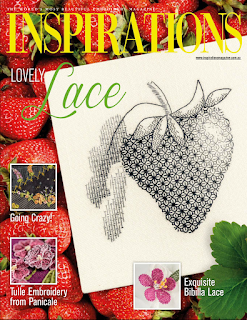 The latest issue of the Australian embroidery magazine Inspirations is out and it is a really, REALLY nice one. 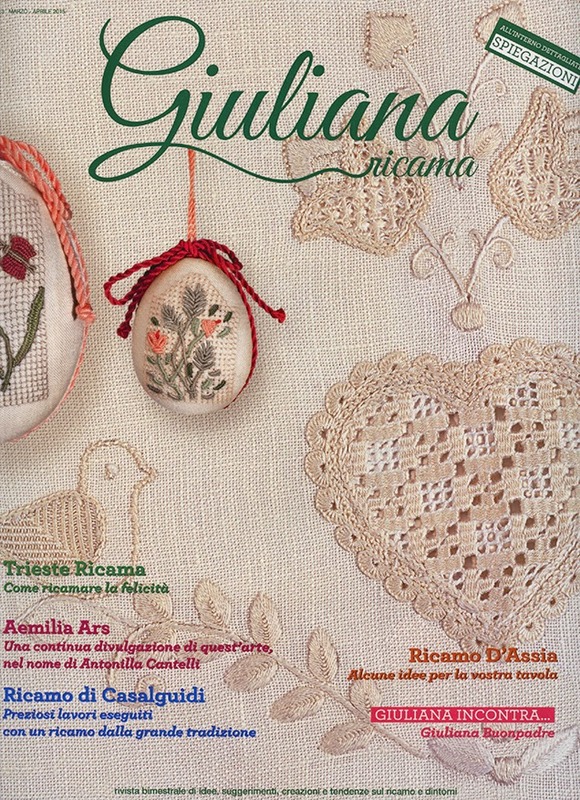 Among the other beautiful projects in this issue are two little Estense Embroidery items from Elisabetta Holzer of Ferrara, Italy. Elisabetta Holzer's Estense Embroidery projects from the latest Inspirations. A thimble holder and a small bell-shaped ornament done in the characteristic colours of Estense Embroidery. I translated the instructions and did some stitch diagrams and I have to say it looks wonderful and I am so proud to have been a part of this! Inspirations really is the world's most beautiful embroidery magazine. As you already know, I absolutely love Estense Embroidery so I jumped at the chance to help make this happen. I had such a good time stitching the projects (I always test out my translations if I can by making the project I'm translating or at least trying out the stitches to ensure that what I've written in English makes sense). 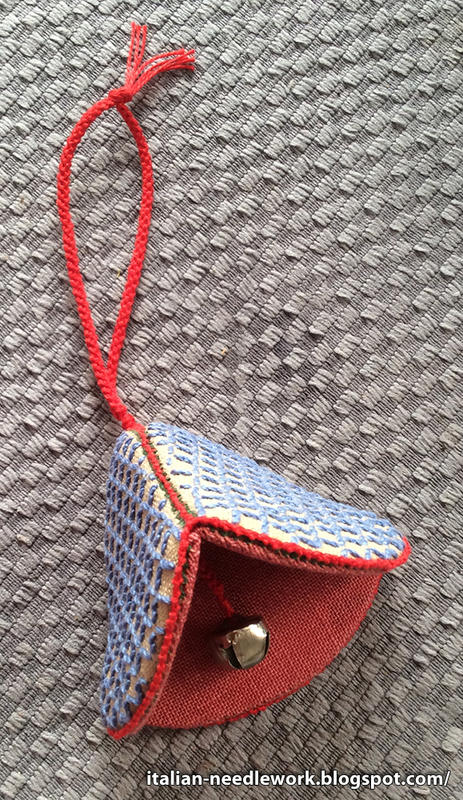 I had never assembled something like this before but always admired those little thimble holders. 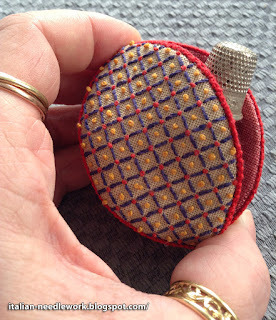 My own attempt at the thimble holder project. There was something very enjoyable about putting these together that made me notice and miss that I haven't had much stitching time lately. 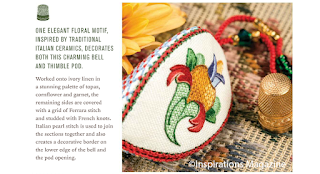 I really only needed to check the assembly instructions for the bell so mine is not as ornately embroidered as the one in Inspirations, but I like it all the same. 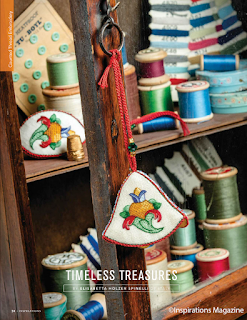 If you haven't take a look at Inspirations for awhile this is definitely an issue to treasure, it is packed with so many interesting historical articles and the projects are outstanding. You can get a digital subscription or just buy one digital issue from Zinio instead of waiting for the mail. I was recently gifted a flight to Italy and as you can imagine, dropped everything and went. I spent Easter in Rome then travelled to Verona, Florence, Prato, Bologna and on to the Valsesia region in the north eastern part of Piedmont, at the foot of the Italian Alps. I had never been to this region and knew it only by reputation of the beautiful Puncetto needle lace so I was very excited to be offered the chance to drive up there with a couple of friends. 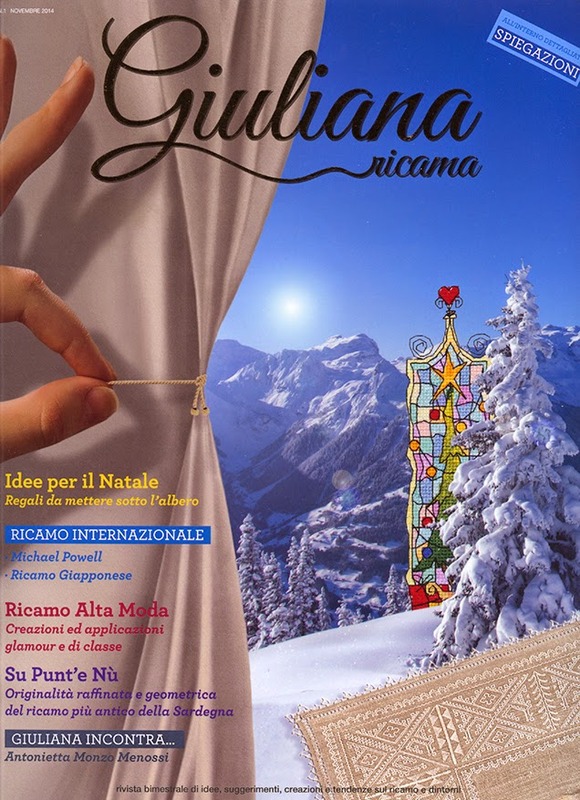 I immediately contacted Paola Scarrone of the Scuola di Puncetto Valsesiano in Varallo to see if I could take advantage of their program "Puncetto whenever you want" which, aside from their other didactic programs, offers you the chance of lessons when you happen to be in the area. 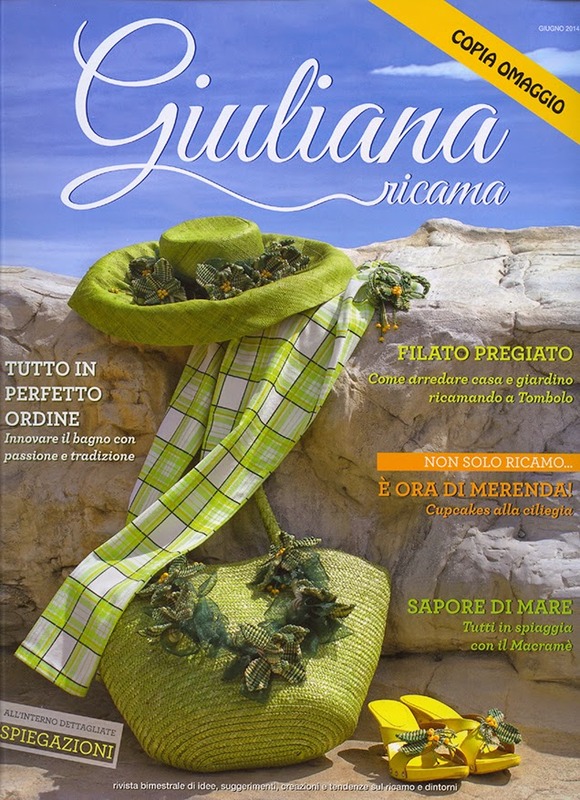 I had recently been in contact with Paola as she and her association were kind enough to provide photography for my latest historical article on Puncetto in the May/June 2015 issue of Piecework magazine. We set up a lesson with Angela Stefanutto who I had previously studied with at Italia Invita in 2011. We arrived at the historic Albergo Italia in Varallo where the lesson took place and were delighted to find not only Angela but the hotel owner's wife Ornella Marchi was also a lover of Puncetto. 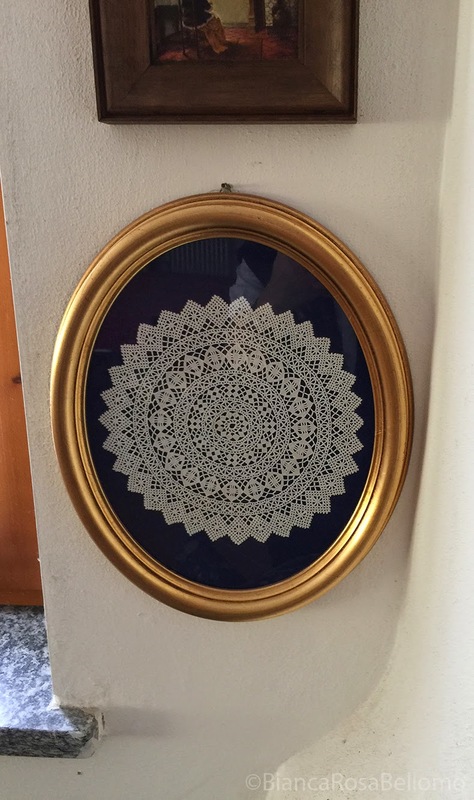 In the hotel lobby are some framed pieces as well as wood cut designs which imitate the lace and the dining room curtains all had inserts of Puncetto, each one different from all the others. 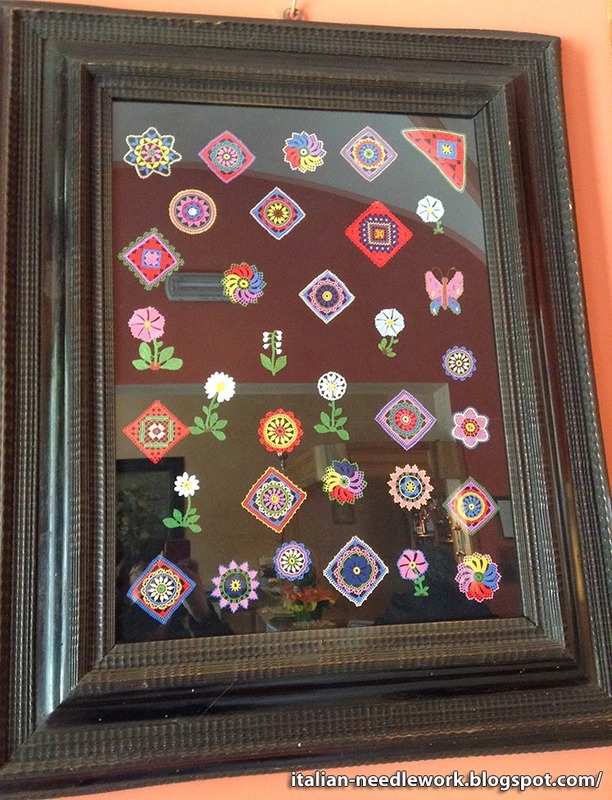 Different Puncetto motifs in coloured thread in the lobby of the Albergo Italia. 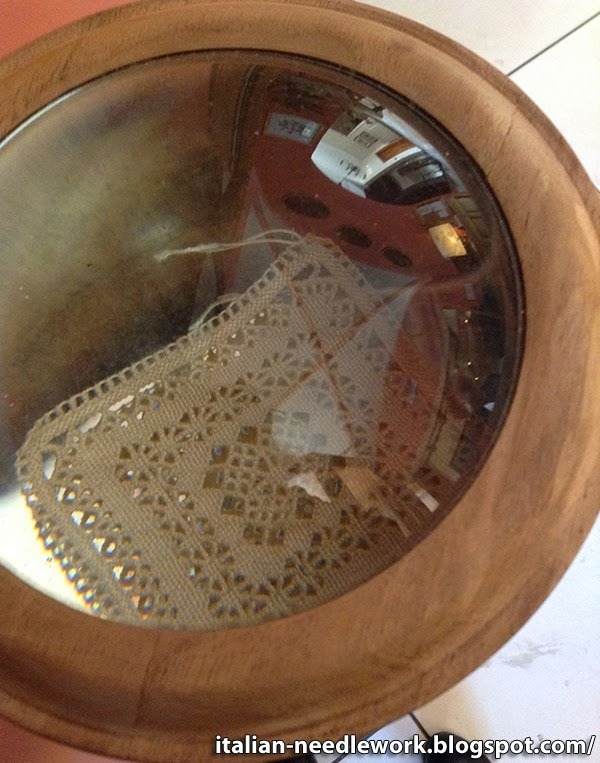 Wooden post with magnifying glass and Puncetto in the knob at the Albergo Italia. We spent a delightful couple of hours together and Angela kindly corrected my mistakes and misconceptions and tirelessly showed me examples of all kinds of different situations. I wish I lived closer to her so I could go to her on a regular basis. She is the very best teacher! 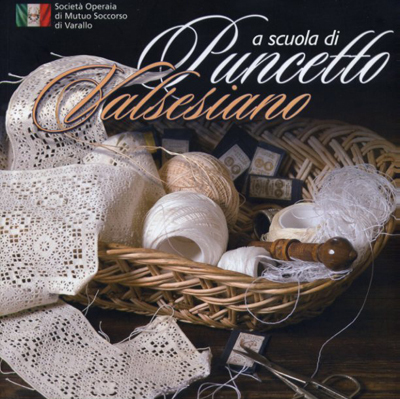 Angela also told me that the instructional book that she and her association had written in 2009: A Scuola di Puncetto Valsesiano had finally been reprinted and was now available for purchase (see below). I know that many of my readers had been frustrated with it's lack of availability so you will no doubt be happy to know that you can now find it. Of the three books that they have written, this is the one you want for getting started. 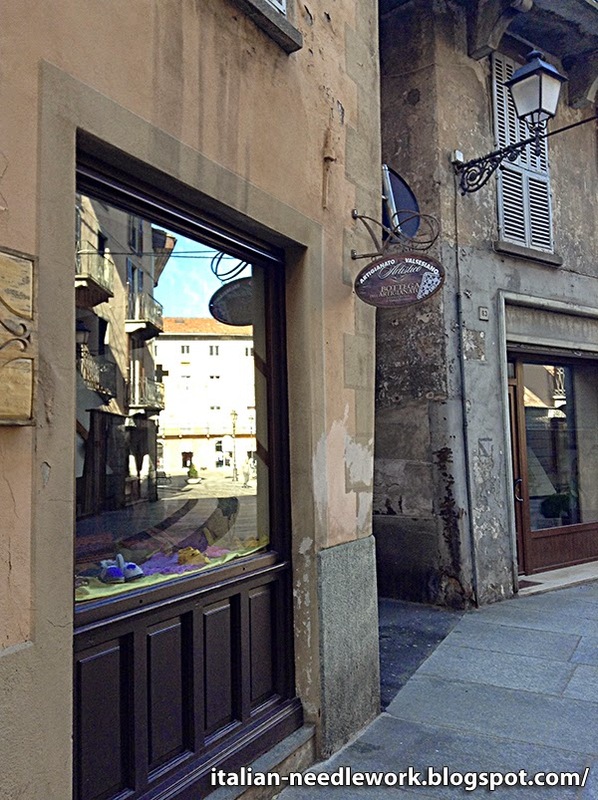 After coffee, we went along to their shop the Bottega Dell'Artigianato at Corso Umberto, no. 1 in Varallo (a short walk from the hotel) where there are all kinds of local artisan items for sale including Puncetto needle lace pieces. The shop Bottega Dell'Artigianato in Varallo. 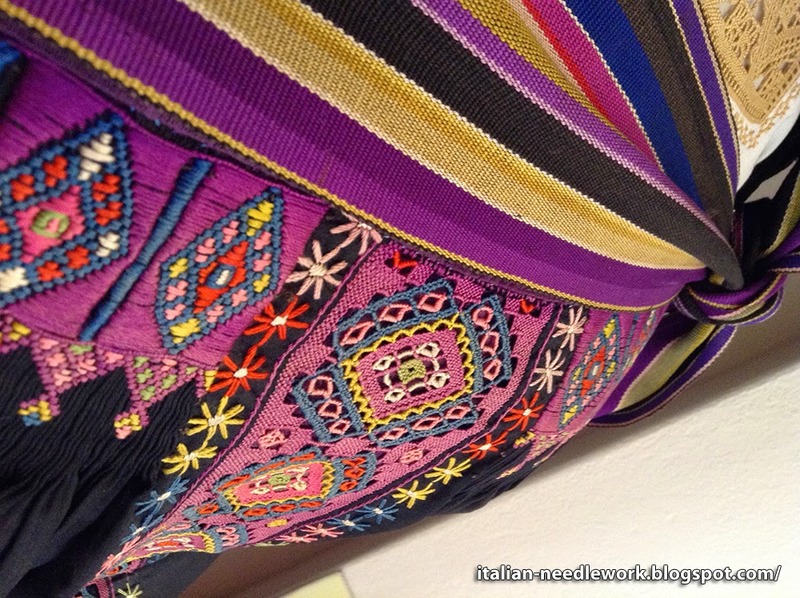 Coloured Puncetto on the apron of a traditional costume in the Bottega Dell'Artigianato. 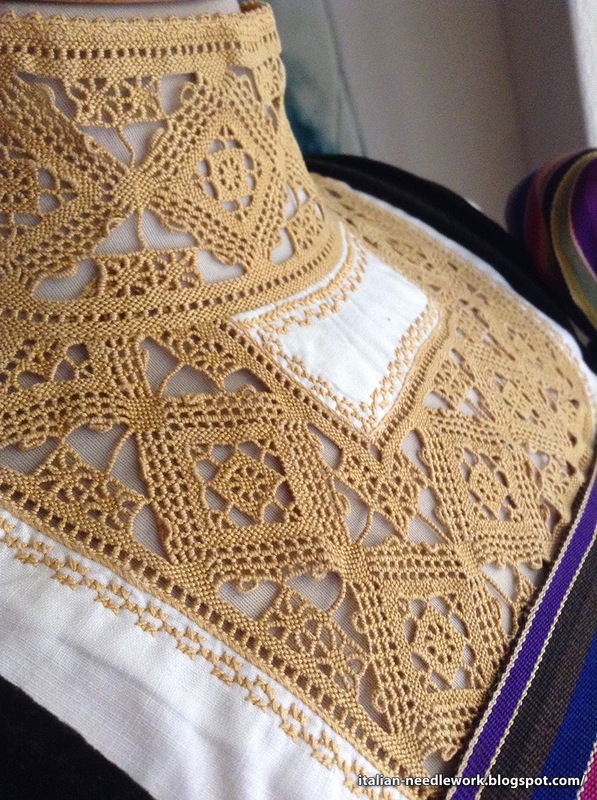 Puncetto collar and yoke on the blouse of a traditional costume in the Bottega Dell'Artigianato. 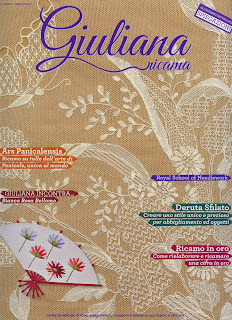 I purchased four small pieces of Puncetto lace and the reprint of the manual. It was so difficult to choose, there were so many beautiful things! Back at our home base in Prato Sesia, our hostess gifted me with an exquisite framed piece of Puncetto which she had hanging in her home. Wonderful framed Puncetto hanging on the wall in Prato Sesia before it was given to me. 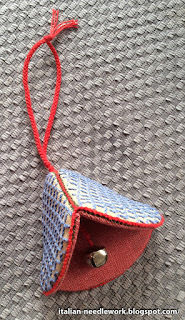 You can purchase A Scuola di Puncetto Valsesiano from Tombolo Disegni. 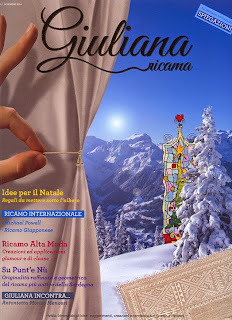 Thank you to Bianca Rosa for the use of her photo!